DEVRENT VALLEY has various types of fairy chimneys. Among these are those with caps, cones, mushroom like forms pillar and pointed rocks. With the action of smaller, secondary volcanoes and the action of rivers, wind and flood waters, this layer of tuff has slowly but steadily been eroded to produce the rock formations know as “fairy chimmeys”. We will take a walk through this amazing valley. PASABAGLARI (MONKS VALLEY) Many fairy chimneys with multiple stems and caps can be found here, this style being unique to this area. A chapel dedicated to St. Simeon and a hermit’s shelter is built into one such fairy chimney with three heads. AVANOS is known for the pottery, a craft dating back to the Hittite period. The red clay which is worked by local craftsmen comes from the residue in the Kizilirmak river. The Kizilirmak, which divides Avanos into two, is Anatolia’s longest river. 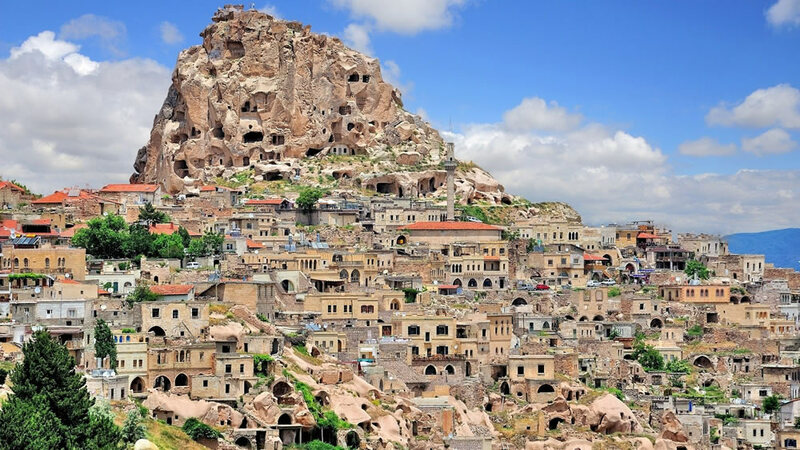 DERINKUYU UNDERGROUND CITY is where dwellings for the Christian communitiest to use as refuges. It contains all the usual rooms found in an underground city such as stables, cellars, storage rooms, refectories, churches, and wineries. Apart from these, was a missionary school. NAR LAKE is one of the crater lake in Anatolia . You can see , visit and have pictures at Nar Lake. SELIME is situated at the end of the Ihlara valley . You can take pictures by the pinnacles where some of the filming of “Star wars” was located. Fairy chimneys rest on the steep hillside, and a basilica style cathedral the Selime Sultan tomb, a hollowed out citadel and churches are also found here.